These kits offer hours of interactive fun for children and adults. 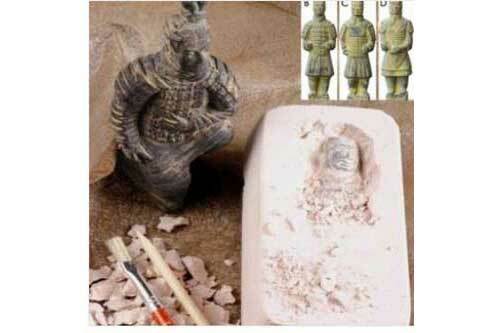 Use the hand tools provided with each kit to chisel away at the solid stone (hardened plaster) to find a buried treasure of Terra Cotta Warrior reproduction. Each set includes: Solid block of Hardened Plaster, Wood Chisel, Brush and Buried Treasure.